Street view of Utqiaġvik in July 2008. 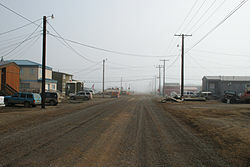 This street, like all the others in Utqiaġvik, has been left unpaved due to the prevalence of permafrost. Lua error in Module:Location_map at line 488: Unable to find the specified location map definition: "Module:Location map/data/Alaska" does not exist. Barrow (/ˈbæroʊ/), also known as Utqiaġvik (Inupiaq: [ut.qe.ɑʁ.βik], English: /ˌʊtkiˈɑːvɪk/ UUT-kee-AH-vik), is a city in Alaska. It is the northernmost city of the United States of America. It is the administrative capital of the North Slope Borough. Barrow is well known because of its unusual location in the United States. It is located on the north coast of Alaska along the Arctic Ocean. There are about 2,100 kilometers between Barrow and the North Pole. Because Barrow is located above the Arctic Circle, there are times of the year during which the sun never sets, and other times when it never rises above the horizon. Instead of dipping below the horizon every day, during the summer the sun circles around the sky above the horizon. The sun sets on November 18 or 19, and remains below the horizon for about 65 days — that is, until the end of January. In the middle of this polar night (December 21-22), the sky is completely dark all the time, except for about 3 hours of twilight. The climate is very cold in Barrow. Temperatures are below freezing from early October until late May. The high temperature is above freezing for only about 120 days per year, and there are temperatures at or below 0 °F (−18 °C) on an average of 160 days per year. Freezing temperatures, and snowfall, can occur at any time during the year. Although Barrow is in the land of the North American continent, Barrow is isolated from any other city. There is no road connecting Barrow and other places in Alaska. Travelers must take airplanes or ships to get there. ↑ 1.0 1.1 1.2 1.3 Geographic Names Information System (GNIS) details for Barrow, Alaska; United States Geological Survey (USGS); January 1, 2000. ↑ "Directory of Borough and City Officials 1974". Alaska Local Government (Juneau: Alaska Department of Community and Regional Affairs) XIII (2): 20. January 1974. ↑ United States Postal Service (2016). "USPS - Look Up a ZIP Code". Retrieved 2016-11-03. Only “Barrow AK 99723” is accepted by the U.S. Postal Service for addresses in Utqiaġvik. ↑ "City of Utqiaġvik website". City of Utqiaġvik. Retrieved August 8, 2018. ↑ "Feature Detail Report for: Utqiaġvik". GNIS. Retrieved August 8, 2018. ↑ Demer, Lisa (29 October 2016). "Barrow's new name is its old one, Utqiaġvik. Local Iñupiaq leaders hope its use heals as it teaches". Anchorage Daily News. Retrieved 18 December 2017. ↑ "NOAA Weather Data, 1981-2010". ↑ "Summary about Barrow NWS Station". This page was last changed on 13 August 2018, at 14:12.